Few months ago, I watched a video in YouTube where a professional golf teacher played a night golf round in Nick Faldo Course, Emirates Golf Club, Dubai. 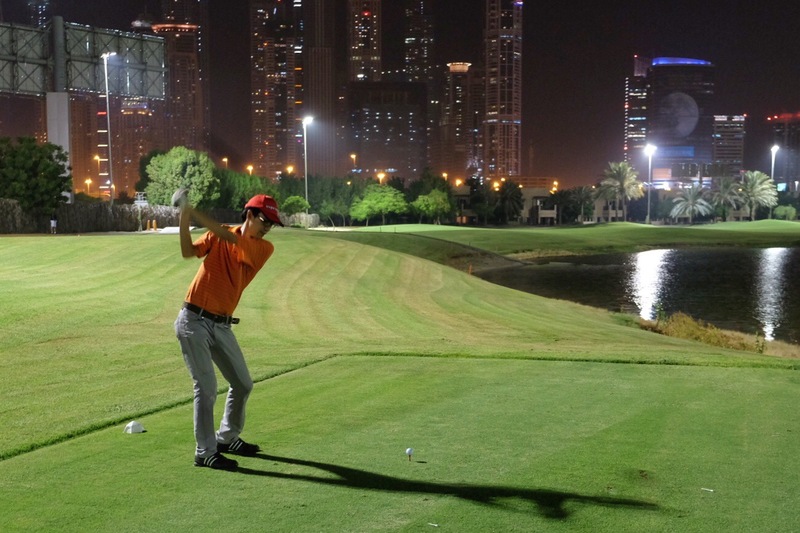 Quite fascinated with the video, I then planned to include a round of night golf in our Dubai holiday itinerary. 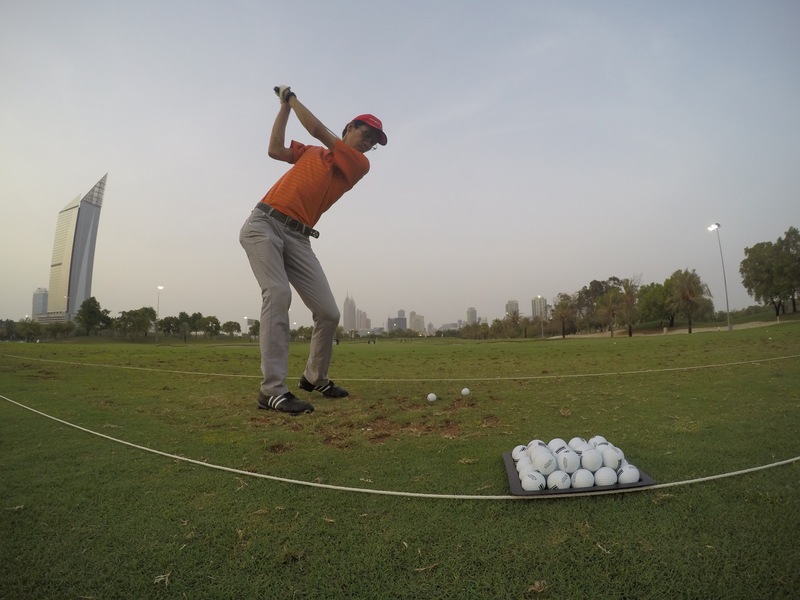 I booked the course and club rental through dubaigolf.com, a travel agent specializing in arranging golf trip in Dubai. I inquired and booked the whole package through emails. I found it very easy, and the staff was very friendly, even accomodating few changed requests on tee time from my side. At the end, they sent me a confirmation form which I have to sign and scan-mail to them, gave my credit card details, and all is set and done. Today, my tee off time was at 7.25 pm. This is right after sunset. I purposely booked the round in this hour as I want to capture the picture on the sunset golden hours (hence my picture above ☺️). I came an hour before tee time, as I was informed by the agent that my round included 100 range balls to practice before my round. Good, because my golf swing was rusty as I didn’t swing any club during whole month of Ramadhan. So I came at reception and gave the lady my tee off time. It was all good, they recognized my booking and my request for golf club rental. So after put my stuffs at locker and changed my golf shoes, here I am, heading to the range to hit some practice balls. And gosh, how this range practice really helped. My golf swing was really rusty, it was hard for me to hitting it flush. Hitting it without using my own club didn’t help the case. 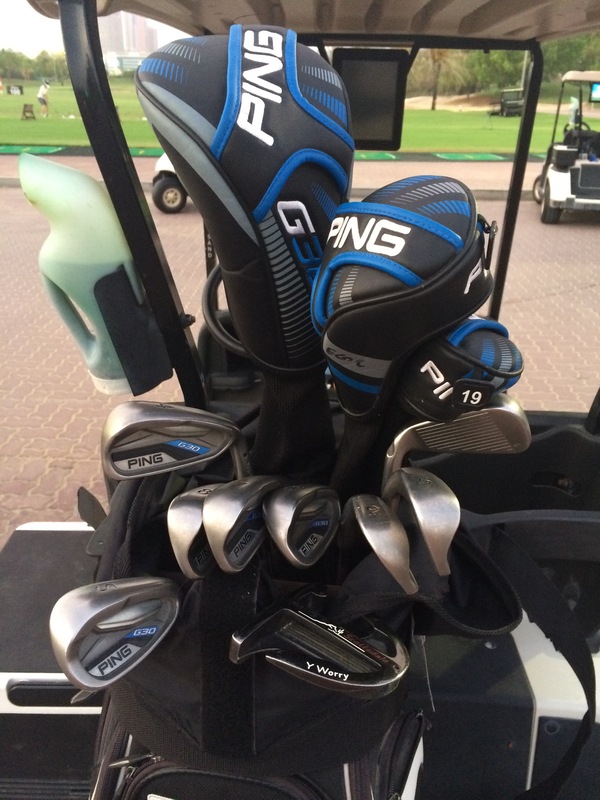 Oh, by the way, my rental club was Ping G30, which I found a bit hard for my liking. But anyway, after 30 minutes of practice, I felt ready for my golf round. I was paired with 3 spanish-speaking guys, one from Bolivia and two from Brazil and Spain. The Bolivian guy was quite good golfer, while the other two were really beginners. So the pace of play was quite slow. But it’s okay as I planned to take pictures along the round anyway, so the slow pace of play was indeed good. So here we go, off to the first tee. My first shot, I thought was quite good. A good fade towards the edge of fairway. But then I realized the problem with this night golf: first, no matter how well-lit is the golf course, it’s still not a day light, there are some areas whereby the lighting was not bright enough, especially towards the edge of fairway or in the rough (where my ball landed). And second, I had no caddie, so I have to rely my eyes to find my ball, which is not easy. So here I go, on my first shot, I already lost my ball. Blimey. Anyway, I kept playing along, and in the end, after 9 holes, I lost quite few balls. Well I did hit 2 balls to the water, but many of them also lost because I couldn’t find them. LOL. I scored over than my handicap, but I managed to have 2 nice pars, one of which I posted the video below when I hit the green on Par 3 Hole 8. On the course itself, I find the course was very well maintained. With the high temperature of Dubai in summer (these days was around 41-42 deg celcius), I was pleasantly surprised to see the fairways, and especially the green was lush and pristine. The green was a bit slow, but the surface was really smooth. 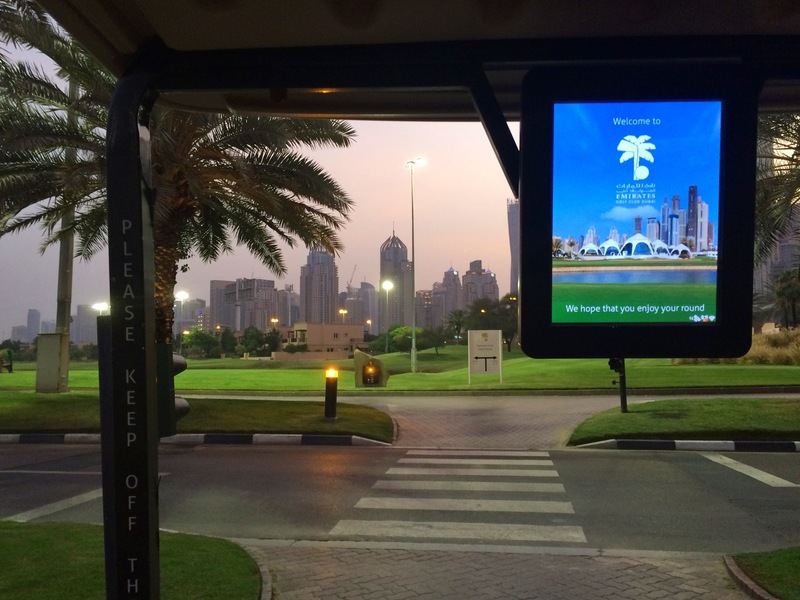 The course alao provide buggy cart with GPS range finder on board, complete with the complete information of the hole you’re playing and the distance. As you can drive the cart inside the fairway and right next to your ball, you can measure the distance of your ball to the green using this GPS range finder on your cart. Very helpful for first-timer like me. The Nick Faldo course itself was not too difficult, I think, but it’s quite challenging with many waters and sand traps along the course. 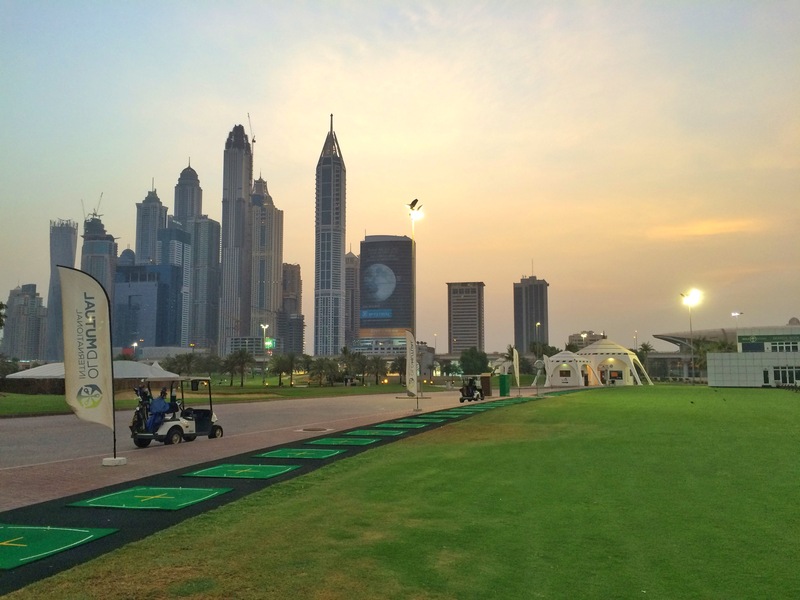 The view of Dubai skyscrappers at the background along the first 9 holes was very fitting with the ambience it night golf. 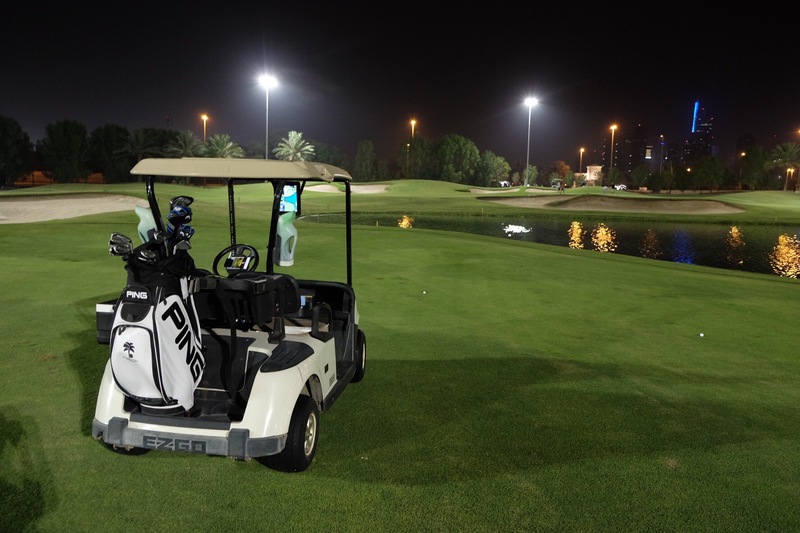 And with its high temperature and humidity in Dubai at summer, this night golf prove to be a real solution for golfers in Dubai. There’s no sun heat at night, but still the temperature was felt a bit warm, and the humidity made my body wet with sweat after the round. 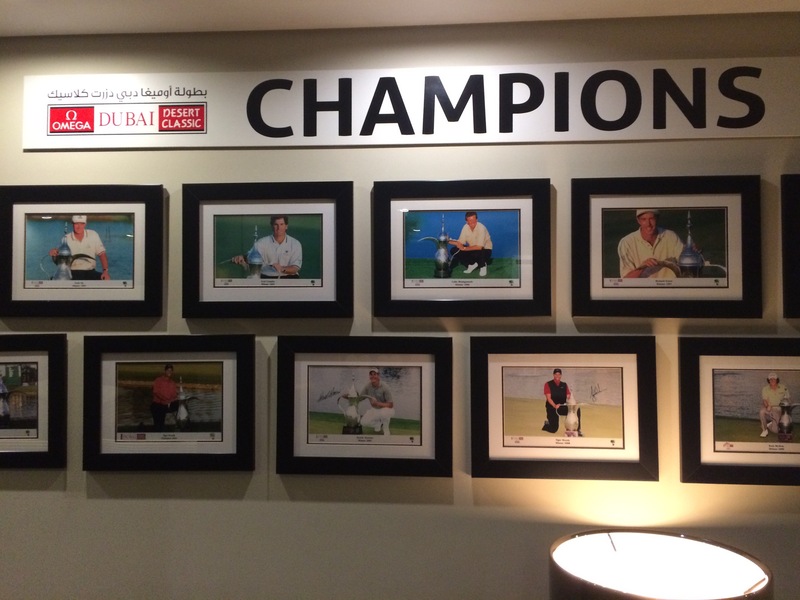 The Champions of Dubai Desert Classic in this course. Placed inside the Lockers. Look! Tiger and Rory!